This tale of deadly epidemic spread features Dr John Stapleton, a forensic pathologist hardened by his experiences of personal and professional loss. When a series of lethal illnesses strike seemingly at random in New York City, Stapleton suspects he has stumbled on a diabolical conspiracy. Doctor and author Robin Cook is widely credited with introducing the word 'medical' to the thriller genre, and over twenty years after the publication of his breakthrough novel, Coma, he continues to dominate the category he created. 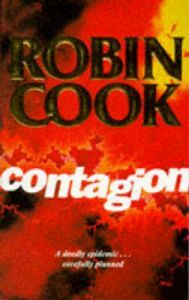 Cook has successfully combined medical fact with fantasy to produce a over twenty-seven international bestsellers, including Outbreak (1987), Terminal (1993), Contagion (1996), Chromosome 6 (1997) and Foreign Body (2008).